When I ran into my former French professor while out shopping several months ago and, during the course of our brief conversation, informed her that I was in the process of reading Victor Hugo's classic 1862 novel Les Misérables in French and unabridged, she replied, "C'est une bonne idée, mais.... C'est énorme!" ("That's a good idea, but.... It's huge!") Now that I've finally completed this self-imposed, ultimately very rewarding challenge (and justification for/continuation of my years of French study), I know that she wasn't just talking about its intimidating length. Hugo's inexhaustible ambition, scope, passion, historical/social expertise, and moral/theological contemplations roil and overlap at all times throughout, often threatening to push against and overspill the novel's generous, 1,000-plus page limits. 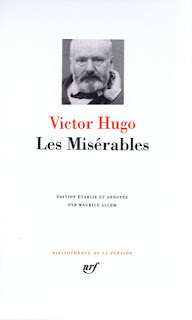 Les Misérables is truly the French War and Peace, an analogous high-water mark of what, in the 1860s, was considered the art of the novel, meaning that Hugo's most famous work is an insatiable beast duty-bound to include everything, to reflect, encapsulate, address, and penetrate the entire world. Of course, if we neglect to allow for historical contex and hold either this mid-19th-century ideal or its practitioners--and Hugo was a prime one--to the standards that have developed in the 150 extremely tumultuous years since Les Miserables' publication, they will seem rather naïve, if not downright presumptuous. Sartre, for one well-known example, kicked back against the Great 19th Century Novels and their unquestioned authority and "genius," spending a considerable portion of his autobiographical Les Mots mocking le dix-neuvième siècle in general, and Hugo in particular, finding them regrettable and contemptible while simultaneously confessing a backhanded admiration, or at least respect, for them. And it is true that the theory and practice of the novel in Hugo's time could scarcely be in starker contrast, not only to Sartre and his ilk, but also to the aestheticizing/"purifying" tendencies of the Joyce/Kafka/Stein/Robbe-Grillet modernism of the last century and their rejection of the omniscient narrator, as well as to the precisely and cleverly structured, disciplined, self-conscious intellectualism of the subsequent, "post-modern" Italo Calvinos, Thomas Pynchons, and Don DeLillos. One only finds the anti-Romantic self-consciousness ebbing a bit with the newly earnest post-postmodernism of our contemporary Jonathan Franzens and Alan Hollinghursts, whose hearts-on-their-sleeves, socially-observant ambitions more closely resemble those of a Hugo. 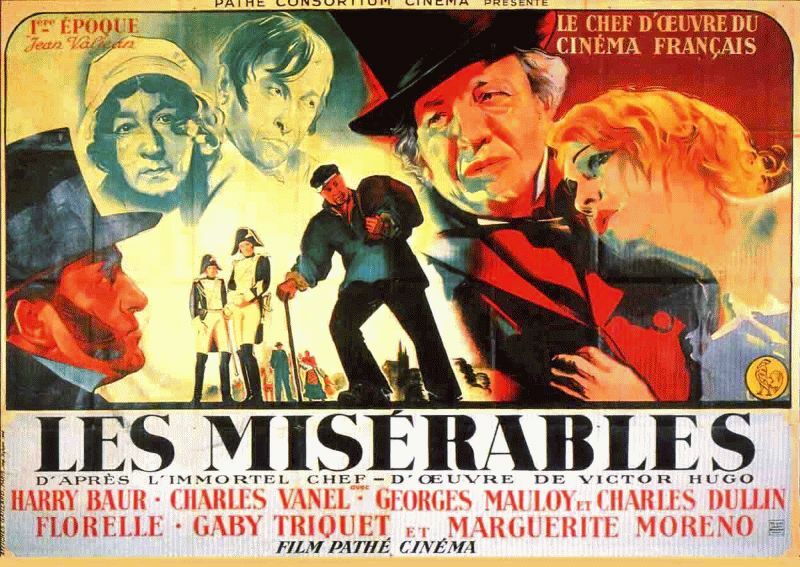 All of which is to say that reading Les Misérables felt less like simply being told a story than attending a compelling, impassioned lecture/monologue, a transfixing story running consistently throughout, by an expert incapable of hiding his driving personal investment in what he's talking about. I would venture to estimate that a full half of the novel is spent on asides, digressions from the characters' trials and exploits, creating a plenitude that renders their stories only the most immediately diverting, brightly exemplary threads in a vast, multi-hued historical tapestry. The ex-convict Jean Valjean, his adopted orphan Cosette, the radicalized bourgeois Marius, the mercenary Thénardier, the punctilious, heartlessly moralistic police inspector Javert, and the myriad others with whom these principals come into contact are meant to be individuals, but individuals who, we are persistently reminded, exist in (and cannot be considered apart from) a particular time and place, in specific historical, political, and social circumstances. If Jean Valjean and Cosette find themselves taking refuge in a convent, there is a long chapter explaining to us the history of French Catholicism, its various orders, and their nunneries, as well as the details of and reasons for their peculiar practices. 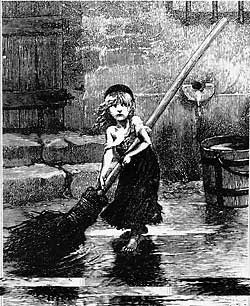 If Jean Valjean is forced to escape from danger into the sewers underneath Paris, we are presented with a thorough study of Paris's sewage system and its fascinating, checkered history, as well as Hugo's singular opinions on the ideal disposal of human excrescence (i.e., he would rather see it referred to and employed as useful fertilizer than considered "waste," which he is categorically opposed to). The failed Paris revolution of 1832 is depicted both in close-up--as an exciting, suspenseful bit of action in which characters we know are directly, tragically involved--and from a historian's distance, as a complex conjunction and culmination of wide-ranging French political factions and philosophies. This occasions a mini-essay in which Hugo brings his moral and philosophical finesse to bear upon the fine yet vital distinction between a "riot" and an "insurrection." One result of Hugo's pattern of emphasis is that the characters are the type of Types that would be roundly rejected by contemporary readers if we were to come across them in a current novel; they are no less at the mercy of their creator and his grand ideas than those of Dickens, and they are blown without mercy in the unpredictable breeze of multiplying coincidence and reversals of fortune. Psychological astuteness, consistency, and believability are not entirely missing by any means, but they undoubtedly come second to illustrating the order of the world as Hugo sees it. We care about them and their fates no less for all that, however, because Hugo makes clear the urgency of those things which they're meant to represent, and we're consistently reminded of the ways in which all of us are--at least when taken out of the center of the universe and seen as but one part of it--"types." This is also in harmony with Hugo's overarching, socialistic conviction--made directly, unmistakably explicit at least once--that individuality, indispensable as it is, can only and should only exist after the common good has been considered. Even what has to be identified as Hugo's inevitable sexism when it comes to Cosette--who, as the only real female protagonist, quite directly represents battered, threatened innocence as a girl and coquettish-yet-kind innocence as a woman--is somewhat mitigated by the fact that most of the male protagonists are no less representative of their salient qualities, and by Hugo's unequivocal endorsement of women's suffrage. The novel's values are, for better or for worse, not "old-fashioned" but simply old, and by no means retrograde for their time; Hugo was, for his day, rather unfailingly progressive. 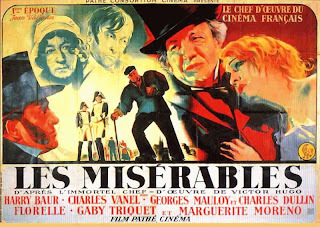 My only prior exposure to the novel having been two film versions (Raymond Bernard's wonderful 1934 film and Bille August's passable '98 adaptation), my expectations were mercifully untainted by Andrew Lloyd Webber, who still must be credited with rendering ubiquitous Émile Bayard's perfectly lovely illustrations, as apt for Les Misérables as John Tenniel's were for Carroll's Alice books. The films, particularly Bernard's, do capture something of Hugo's story, and some of his spirit. Still, one of the most remarkable things about Hugo's tome, the overarching reason it takes one's breath away--and what makes it, specifically, a great novel--is that, as a work from an era, pre-radio, pre-cinema, and pre-TV, when the novel was popular culture, it is possessed of and madly driven by a confidence, a sense of purpose, a mission that are no longer, and can no longer be, the provenance of the novelist. Hugo's time and place demanded both more and less than Oscar Wilde's or Virginia Woolf's--or our own, when a justly celebrated novel like Tom McCarthy's perfectly self-contained, thematically disciplined, emotionally submerged C seems almost the opposite of something like Les Misérables. To be an aesthete or a modernist, however brilliant or focused, would have struck a humanist like Hugo--so on fire with love and sadness for humankind, and so luxuriantly able to express that passion unfettered by self-consciousness--as absurd. Since Hugo's time, the novel has become something we expect to be a polished diamond, lean and dazzling--a work sculpted to whatever specific, intellectually irreproachable contours the well-read and acutely (self) aware author sets for him or herself. 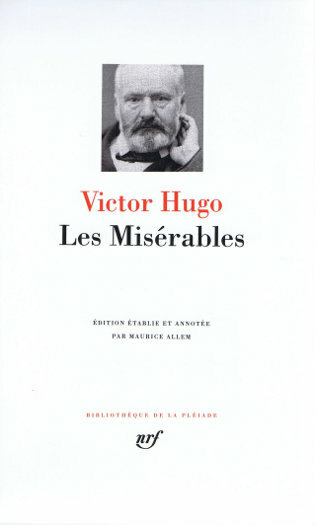 To judge from Les Misérables, Hugo would have felt stingy offering us just the diamond, when for him it is only the gem as we may discern it amid its asymmetrically, unpredictably structured and constantly digressing bed of coal that constitutes the whole, rich, insatiably searching, restlessly all-encompassing experience the novel was once, however romantically, however impossibly, meant to be.